QuiltMyShirts | T Shirt Quilts made with quality construction! Merriam Webster’s definition of a “Quilt”– A bed coverlet of two layers of cloth filled with batting held in place with ties or a stitched design. Here at QuiltMyShirts.com, we make T-shirt quilts.We do not advertise quilts and then make you a blanket, as some other t-shirt “quilt” companies are doing. Why does it matter? Blankets are stretchy and thin. They will only hold up as long as the t-shirt holds up. How many of your shirts have seen better days just from wear? A blanket will wear out just like your shirts. There is nothing in-between the shirts and the fleece backing to keep them stabilized. T-shirt blankets are made by taking the stretchy t-shirts and constructing them (envelope style) with a stretchy fleece fabric for backing. There is no reinforcement to stabilize these two layers. When they are washed the 2 layers have the tendency to shrink at different percentages, resulting in a distorted throw. They are very economical as they only take a few steps to construct, but unfortunately you will only get a few more years out of your t-shirts. Our quilts are different. We produce a premium, quality product. They are made with the finest quilter-grade fabrics (Retail $11/yrd+), high-end cotton blend battings and professionally machine quilted using state-of-the-art computerized equipment to apply patterns that are less than 2″ apart for density. This process stabilizes all 3 layers and is the secret to your quilt lasting a lifetime. 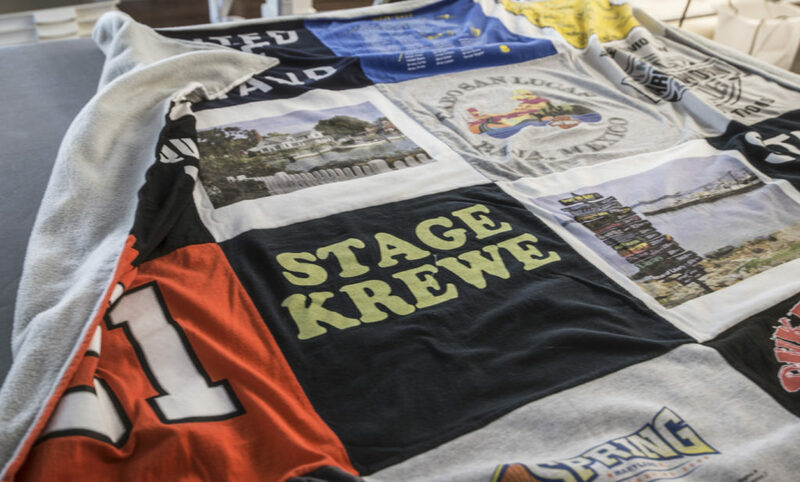 Bottom line…..There is a world of difference between a t-shirt blanket vs. a t-shirt quilt. Make sure you research the differences on your own and compare apples with apples..
Quality is the most important thing at QuiltMyShirts.com. We use 100% quilter’s grade cotton for all sashing and backing fabrics. 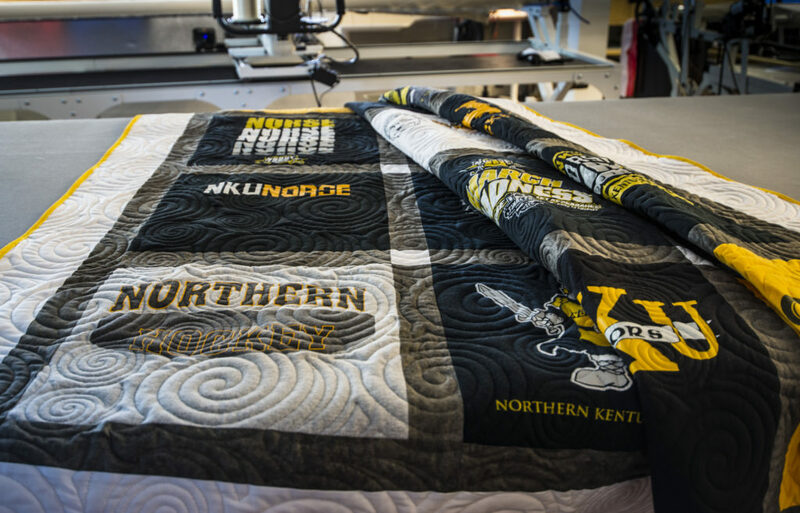 All quilts are professionally machine quilted using computerized, state-of-the art equipment. Our patterns are less than 2″ apart in density, making them last for years to come. Our quilts are NOT hand-tied. Hand-tied quilts will not hold up to the multiple washings these quilts will undergo. We use a strong non-shine clear thread for maximum durability. Our battings are high-grade poly (20%)/cotton (80%) blend for the perfect weight and softness. We hold a NC bedding license, assuring you the exact fiber content of the materials used will be listed on your finished product. Bottom line – if you want them to last a lifetime, have us make you a QUILT! Can you use different type shirts other than cotton t-shirts? Yes! Just about any type of material that lays flat will work. But there are a few exceptions! Below is a list of what we can and cannot use. If you don’t see the type of shirt on this list, please feel free to contact us. sports jerseys (please be aware that if you send us a tank style it will incur extra piecing charges. knit items such as sweaters, afghans, scarves etc. Do you send out a notification when my shirts arrive ? We do not send out emails, but all you need to do is check Orders Received page on our website. Usually shirts received are posted within 24 hours. Should I cut my shirts to save money on shipping? Some customers have pre-cut their shirts thinking they could save some money on shipping them to us, only to find out that they cut them too small for us to make our normal block size. In these cases, we either have to rebuild the blocks that are too small by piecing them or cut all the blocks a smaller size which reduces the size of the quilt. We charge an additional $8.50 to piece a block, so the pre-cutting can actually end up costing you more money. If you have large to X-large shirts, adult male shirts or larger you could possibly pre-cut them but we require a minimum 16″ X 16″ block. Can I use photos ? Yes, we print photos onto a soft premium cotton knit fabric. We need an electronic file such as jpg. You can read more about our photos on our options page. We charge an additional $15.00 a block per photo block. When and how will I receive my final balance ? When your quilt is almost ready to ship you will receive your final invoice by email. You can open your invoice in your email and pay it directly from your email. Once we have received your final balance your quilt will be shipped to you. We cannot accept any Money Orders. Do you use interfacing between the shirts and the batting ? Recently we’ve been asked this question quite a bit since some companies have recently started to claim they make T-shirt quilts. Here is my response to most of those emails. “YES!!!! We do use an interfacing on the backs of these shirts. If you’ve been shopping around on the internet, there a few sites that discourage this procedure. The reason they discourage this is because they simply are not selling quilts. They are selling blankets and mis-leading customers into thinking they are quilts.. With a blanket, there is no batting in-between the layers and no need to machine quilt the layers together. We use a soft interfacing on the backs of the shirts to stabilize the shirt for the quilting process. This interfacing washes out (dissolving) after multiple washes, leaving the quilt that much softer. Within the last few years, quite a few new sites have popped up indicating that they make t-shirt “quilts” when in fact they are making “blankets,” discouraging the use of interfacing which has been the standard practice for t-shirt quilts from experienced quilters for years and years. Because of this recent competition, I decided I would offer the same product as they were offering. A simple quilt “blanket” made only of un-stabilized t-shirts with a fleece backing. I made up a sample quilt… I did not back the shirts with interfacing and put a fleece backing on it. After I had completed it, I realized I just could not put out quality like that. It was very, very stretchy, it felt awful. I washed it and watched the two ply of layers shrink inconsistently leaving it very distorted. Because of this experiment, I decided I would not compete with this type of product. I really feel for all the people who are getting mis-led by these companies. We are frequently getting asked if we can fix a quilt like this. Our answer is usually no. Please make sure you are comparing apples to apples when shopping around for a t-shirt quilt company to fill your needs. Can I send my own fabric ? You are more than welcome to send us your own fabric. The fabric must be quilters grade 100% cotton. Please refer to the chart below for yardages. We cannot accept backing fabric but we welcome you to send your own sashing and corner block fabrics. We will supply a backing fabric to coordinate with your fabric. We will also deduct $20 from your total order if fabric is included. I am worried about sending my shirts, they are my lifelong memories. We understand that shipping your memories may seem scary. However, the tracking systems used by carriers today know precisely where your package is at any time. In the 16 years we’ve been in business, we have never had a customer lose their package shipping it to us and we have never lost one shipping their quilt back. We also do our best to take good care of your shirts while they are in our hands. Your order is logged into our system and placed in its own separate bin. Your bin contains all the information you sent us and your order is printed out exactly how you originally entered it. It is attached to your bin along with your name, and stored in a rack system that keeps every order separate. When your order is started, we review all your notes and instructions again to ensure complete accuracy. What is the best way to ship them ? Shipping costs depend on the size of the box, the weight, and the distance and area from which it is shipped from. You can’t change the area you live in, but you can use the smallest box possible. Pack the shirts in the box as tight as possible without overstuffing the box. Rolling the shirts, or a tight folding job, makes a huge difference on how small a box you can use. A box with that has extra space will most likely be crushed and subject to opening. The boxes that show up in good condition and unharmed are those that were packed nice and tight with a quality shipping tape. The boxes that show up crushed and partially opened are the oversize boxes with a sparse amount of tape. Please do not use styrofoam peanuts! This is just a waste of money and creates a mess when it’s opened. Please use one large bag to put all the shirts in before you box them up. A trash bag is fine. The bag’s purpose is to keep all the shirts together should your box become crushed or opened. Individual bags do quite the opposite. They are slick and if a box is crushed or opened, they can slide out very easily. We ask that you do not ask for a confirmed signature. We do not always work set hours and sometimes we are away during deliveries. We have video surveillance in the area where we receive packages and once the package is delivered (if we are not there) we get phone notifications. If we need to sign for your package, that creates a delay in us receiving it because we then have to physically go to the post office and pick it up. If you need a signature, please use UPS. They always require a signature and they will redeliver the next day if we are not there. How do you know which side of the shirt to use or how do I mark them ? Normally we use the side that has the largest graphic. If you want us to use both sides of the shirt, please mark the shirt with either a note pinned to it or write on painters tape and stick it on the cloth of the t-shirt – not the graphic. Please do not use masking tape as this causes a residue hard to remove. You also need to mark the shirt if you think we will be unsure of what side to use. Please do NOT use Duct tape. Can I plan my own layout ? Normally we just arrange the shirts by alternating lights and darks. You may however use one of our layout grids provided here Layout Sheets or you also can simply snap a picture of the layout and include it with the shirts. These pictures can be printed out with black and white ink or color. How many shirts make a good sized quilt ? Quilts look good when there is a balanced number of rows. For example, if you sent 20 t-shirts, the quilt would be in rows of 5 blocks x 4 blocks and this would look good. If someone sent us 23 t-shirts, we would need to add an extra graphic to bring it up to a 24 (long twin). Quilts look best when the following number of shirts are sent: 16, 20, 24, 25, 30, 36, 42, 49.